When I decided to put this website together, I didn’t want it to be another “run of the mill” review site. What I have aimed to do, is to create something that gives you a bit more than just how good or bad a particular faucet might be. So, that’s why you see this information page in front of you now. When you get a problem with the faucet in your kitchen, it’s very easy to think the manufacturer is at fault, or that your faucet has just reached the end of its shelf life. Whilst both of these statements can be true, if you’re suffering from any problems it’s worth taking a look below to see if the issue can be fixed (and this is before you reach for your purse in order to pay a plumber). This is one of the biggest complaints I come across. We in the US are a nation that loves all things “DIY” and we would all rather have a go at installing something ourselves before getting a professional in (well, most of us anyway). The trouble is people tend to just dive in without looking at the instructions properly, and it’s very easy to miss something during installation that can cause at least one or two of the other issues I mention here. The one piece of advice I can offer you is to take your time. 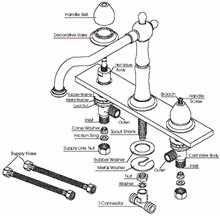 Make sure you have all the necessary tools required set out before you even think about installing your new faucet. If you have trouble understanding the instructions, you could try turning to the internet, or many manufacturers have excellent technical departments that will be happy to talk you through the process. Yes! Leaks! Boy, can this be a problem and it’s actually one of the main reasons people decide it’s time to change their kitchen faucet. Leaks can come in all forms. You might notice that your faucet is wet around the base of the spout. It could be that you have an annoying drip or that water just leaks out of the one place it shouldn’t when you switch it on. However, there are a couple of things you can check before you reach for your wallet (and then have to go through the pressure of installing a new one). All of these issues can be down to two things. Depending on the type of leak, you might need to replace the O-rings (these tend not to last as long as your faucet), or it could also be that you have another part that’s worn out and needs replacing. In either case, it’s best to refer to the manual you were originally provided with (if you still have it). For most of you, this problem can be resolved simply by making a quick trip to the hardware store to buy a replacement part. If the water pressure suddenly drops when you use your faucet, the most likely reason is you have a build-up of mineral deposits inside. 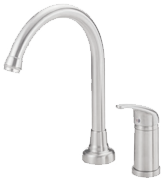 Most modern faucets can be taken apart so you can clean areas where lime-scale sticks. In fact, if you live in a hard water area it’s a good idea to make this one of your monthly household chores to prevent this from happening. In more serious cases, the problem might have something to do with your water supply, but this tends to become apparent if you have a water pressure problem in other areas of the house. If this happens, I suggest you give in and call a plumber. You have to be pretty careful if your faucet starts to show signs of rust. Once you see it from the outside, the chances are it’s already formed on the inside and this can affect the quality of your tap water. Other forms of wear and tear could include the overall finish starting to look a bit shabby or difficulty with moving levers or spray heads. Unfortunately, in this situation you’re probably better off buying a new one but I would advise you at least get a plumber to take a look first.